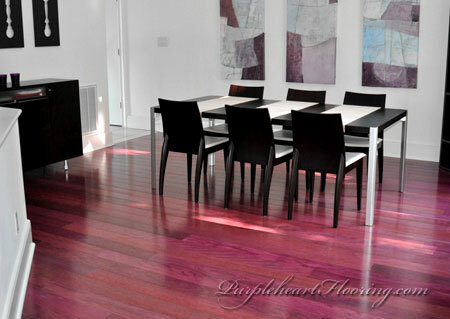 Don't be surprised to hear those reactions after you install purpleheart flooring. This exotic hardwood creates a surface that is as durable as it is beautiful. What makes purpleheart so special? Sustainably grown in South America, purple heart is a one-of-a-kind hardwood with character to match. The fine burgundy wine color of the heartwood comes naturally. This exotic wood also has a Janka rating of 1860 and is almost two times stronger and more durable than cherry and teak. Discover more facts about Purpleheart wood. If you feel that this is the hardwood floor for you, contact us to buy Purpleheart Flooring. © PurpleheartFlooring.com, All rights reserved.